This weekend marks the ‘end’ of summer – our pool closes for the year on Monday. Baseball postseason is right around the corner, and kids across the country are heading back to school. Even so, it will be hot in Washington, DC for another month at least. Until it cools down for good, refreshing beverages are a must. When my friend Greta suggested a Dirty Shirley, I knew I’d have to try it out. After all, I drank Shirley Temples for years at special occasion family dinners (and at least 6 of them at my grandmother’s 2nd wedding! 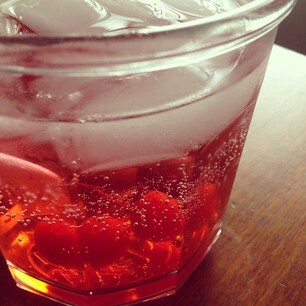 those maraschino cherries… yum!). Pour vodka over ice in glass, and fill to the top with Sprite. Add grenadine and garnish with cherries to finish. 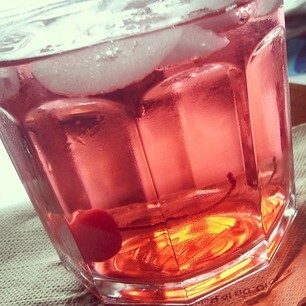 Note: If you love cherry flavor, add another splash of grenadine to your drink – it’ll make your day. Recommended for: those looking to try a childhood favorite turned adult beverage, fans of cherry flavored drinks, and any event that would be livened up by a tasty red number. You had me at vodka and cherries ;) I must try this. Down and dirty! A great way to say goodbye to summer and hello to Fall. Cheers! I've never heard of Dirty Shirley -- too fun. Sounds good and looks pretty. Oh, a Dirty Shirley- HOW FUN! I've never heard of one before now, but you can bet I'll be trying it next time I made a batch of Shirley Temples for the kids. I'm betting Cherry Vodka would be awesome in there, too. YUM. I loved Shirley Temples! Never thought to make Shirley Dirty, LOL. What a great cocktail! So glad to learn that the "dirty" part was vodka. I had an initial, horrible thought that it involved olive juice. Thanks for visiting Rose City Reader and leaving a comment so I could find my way to your terrific blog. Love the color! Just beautiful. have actually had one of these before, and I agree—very yummy! What an amusing name. It looks refreshing and fun. Sounds good. I like my drinks fruity. This looks delicious and yet simple. I definitely need to make this!